Nowadays the term found footage doesn't immediately install in me a sense of dread, there have been a load of great ones over the last few years such as The Dark Tapes, Capture Kill Release and A Guidebook to Killing Your Ex. 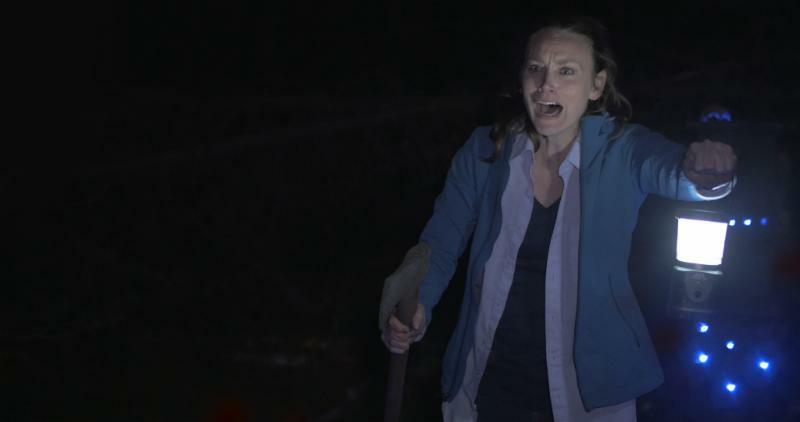 However Altar takes a page right out of the original wave of found footage horrors, and while it doesn't resort to the hated shaky cam it does still follow tenaciously the tired tropes of the genre. 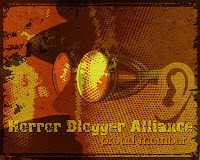 The film starts with a trick in that the first six minutes is a found footage in microcosm. 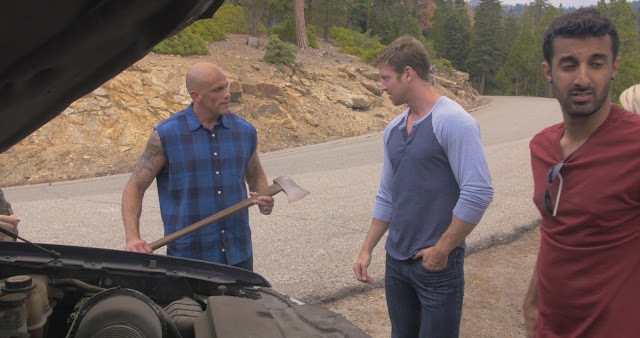 We are introduced to a newly married couple staying at a cabin out in the middle of nowhere. Over the course of this mini film they are introduced, go to the woods, have the obligatory getting lost scene before stumbling across an altar and being killed by the film's antagonist of sorts; Ripper (Michael Wainwright). Once this was over and the film began proper I had high hopes, it felt to me like that was almost a spoof of how traditional found footage plays out and that Altar was going to do something far different, sadly that isn't the case at all. One of the movies biggest faults is just how long it takes for horror to begin. I'm all up for the set-up, it is a good way to make the viewer care about the characters, and a good way to show the why and how they got to the scary part. However here it is an hour into the 80 minute film that this horror finally starts, with just 20 minutes left there just isn't enough time to make up for lost time. This finale goes along at a breakneck pace and has a couple of good moments that include one effective shot of a hand reaching out of the darkness, but it felt like too little too late in terms of starting what is meant to be a horror film. What I can say in the films defence is that I found some of the characters to be pretty interesting, in particular Bo and Maisy. Bo isn't on camera too much but it made a difference to have such a young character, he is in his teens while most the rest of the cast are in their mid twenties. You get a nice sense of isolation for him, shown none more clearly when the friends first meet up when we get a protracted scene of everyone saying 'hi' and hugging each other while Bo watches on. 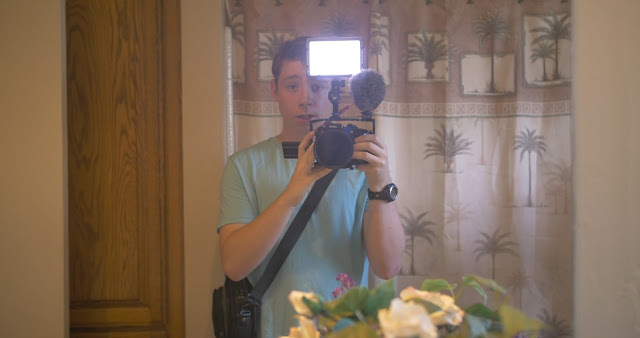 With him you also get a good enough reason for a character to be constantly filming, it is his new passion and helps him to interact more with people. I loved the relationship him and his sister have, you can tell that they really love each other and there are some nice scenes of downtime that really gel them together. Both actors are well suited. I found the character of Ripper to seem a bit out of place, he appears at several points and is acted fine enough but he comes across as a typical movie bad guy but slotted into a genre that is meant to be more realistic than a typical horror and so he stands out as a bit cartoon like. The plot is pretty simple and sets up a few sub plots that fizzle out into nothing. There is a guy who cheats on his girlfriend, while Maisy and her ex seem like they may get back together but then these topics aren't really explored The concept of a strange altar in the woods was cool but it had a strange artificial look to me, I couldn't place my finger on why it seemed out of place. I did like the camera work, it was good there were not many shaky images, and the sound quality was also really good, but towards the end the usual tropes of footage glitching out appeared, and the whole 'lost in woods' thing has been done to death by now. Altar isn't terrible, it is well crafted, there are a couple of moments of effective horror and I did enjoy the false beginning, however for me it just took far, far too long to get going and was a little bland as a result. At least we had some likeable characters to stick around with before it begins proper. 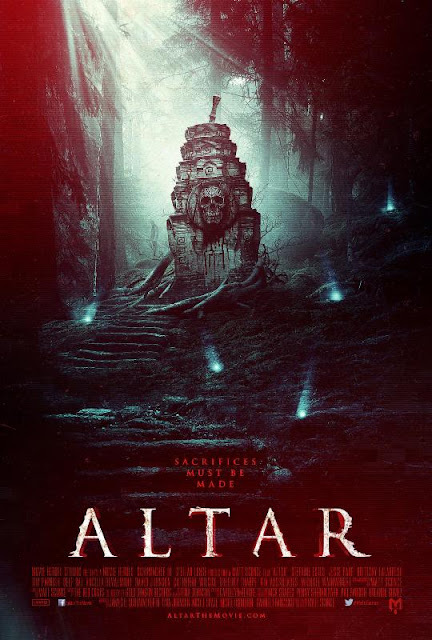 Altar is now available on Digital HD on all the major platforms thanks to Movie Heroes Studios and Disribber, check out the (actually pretty cool) trailer below.